Very friendly staff and atmosphere. Nice inviting pool. The BBQ is a must, the meat was cooked perfectly by the owner. Comfy beds and the breakfast was basic but good. First of all the place has a pool which is nice in this warm area. Secondly the staff is very nice and helpful. They organised a barbeque the same night which was alright. There's also fans in the room and mosquito nets above the beds. Pool and area to relax in hammocks was nice. Breakfast was good. The best hostel we’ve stayed at in South America. For a tiny price you get clean, comfy rooms, a pool, a really cool bar area with cold drinks and a pool table. But the best thing about this hostel is without doubt the food. It’s insanely good. The chef, Diogo, puts a crazy amount of work into the food he serves, and the end result is great food for pocket-change. We paid the equivalent of €3 for a dinner you’d be happy to eat in a 5 star hotel. Some days he also does a barbecue, which you’d be crazy to miss (always vegetarian options available too). He’s also just a top bloke. Couldn’t recommend this place more highly, the perfect way to start or finish a stint in the Amazon. Not much to like; the staff didn't charge me for my second night there due to the bed bugs so I can't fault that part of their customer service. My first time in Rurre for work, the staff was very helpful and friendly. Loved the vegan option at the bbq. Everyone at the hostel was very keen to help. Great location, nice hammocks to chill during hot days. I liked the pool, hammocks, bar and good international ambiance. Super friendly stuff and nice bbq. Everyone was having lots of fun. Nicely decorated with lots of graffiti and a small pond with turtles. A small pool in the middle of the courtyard. The main area around the pool is lovely. Great atmosphere with friendly staff and a good barbecue. Nice warm shower. One of our best sellers in Rurrenabaque! 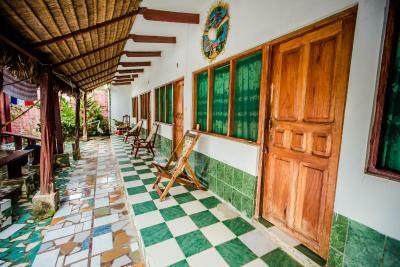 El Curichal Hostel in Rurrenabaque provides accommodations with water sports facilities, an outdoor swimming pool and a garden. Featuring a 24-hour front desk, this property also has a restaurant and a terrace. Free WiFi is available. All rooms at the hotel are equipped with a seating area. The rooms will provide guests with a dishwasher. Continental and buffet breakfast options are available daily at El Curichal Hostel. When would you like to stay at El Curichal Hostel? This quadruple room has a patio. This family room features a patio. 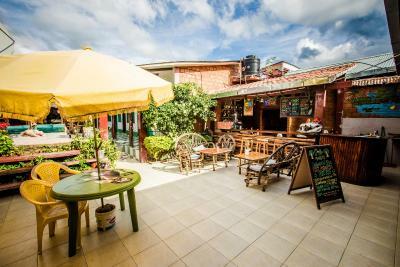 House Rules El Curichal Hostel takes special requests – add in the next step! Shower-/ Toiletrooms are basic and a bit dirty, the bin for used toiletpaper was overfull the whole 3days of my stay. Seems the personal don't care so much with cleaning. The room was a bit hot even though there was a fan, but that's the tropical climate fault. There are only screens on the windows so there is no way to block out noise if you need to. Read about nice bbq and pub quiz, but unfortunately there weren't any during the 2 nights we stayed. No wifi signal in matrimonial rooms behind the pool. Nice pool, cool hammock area. No aircon and very basic accommodation. No atmosphere. Atmosphere was very nice and chill, nice pool, hammocks, room and beds was comfy. Breakfast was ok! Breakfast was pretty poor. Guests can’t use the kitchen. The hostel has nice private rooms and a patio to relax. There is also a pool, wich is nice when it’s so hot. They offer a bbq almost every night, which is super good! The cook is a cool, funny guy! Loved the host! He was very helpful and sweet. He made daily bbq's which was a great way to meet new people. Public bathrooms could be cleaned a bit more carefully ... the dirt tracked in from outside made the floor messy. More comfortable tables in the breakfast area would be welcome - thd high tables and stools were awkward. Rooms hot and old but fine for 1 night stay. The hostel was pretty cool with a nice swimming pool. The rooms were ok, equipped with a mosquito net which is very important. The Portuguese guy working at the bar was very nice. The fact that there is no kitchen to prepare your own food is a pity. There are restaurants in town, but it feels like they want to charge you for too much in this way. There's plenty of good food available in the town, especially fruits. Now it's almost impossible to prepare something yourself. Also the room has no lockers, but there are some lockers near the reception. Lack of working fans and only a handful of bathrooms. The BBQ dinner was absolutely fantastic, and the chef was hilarious - made us feel so at home. King of the Grill!